Michael is a licensed attorney in the state of Texas who has been working at Komie & Morrow, LLP, since February 2018. A graduate of Georgetown University and Baylor Law School, Michael handles personal injury cases with catastrophic damages. 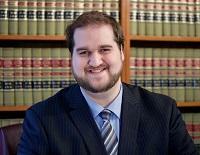 While pursuing his bachelor's degree at Georgetown, Michael played Division1-AA football as an offensive lineman. During the 2009-2010 season, Michael was on the Patriot League Honor Roll. After obtaining his bachelor's degree, Michael attended Baylor Law School, where he achieved the rank Barrister in the 2016 Strasburger Price Moot Court Competition. Michael earned his Juris Doctor in April of 2017 and was licensed by the State Bar of Texas in November of 2017. Michael enjoys watching football, cooking and spending time with friends.